The IFS 125/HR Brüker spectrometer (figure 1) utilises a Michelson interferometer with an optical path length of 942 cm for single-sided data acquisition; optics f/6.5. This instrument has three internal light sources: Hg-Arc lamp, 5-1000 cm-1; Globar source, 10-13000 cm-1; Tungsten lamp, 1000-25000 cm-1. The spectrometer is also equipped with an array of optical filters, detectors and beamsplitters offering continuous spectral coverage from the THz to the mid-IR regions. Sample compartment (circled) can fit multiple accessories. Figure 1. The Bruker IFS125HR FTIR Spectrometer. 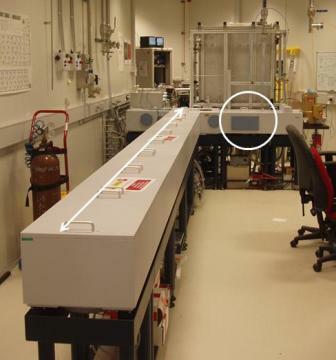 The instrument can be connected to a multitude of accessories and components (table 4) via the sample compartment, allowing a variety of gas and condensed phase experiments to be conducted; see Samples for more information regarding available sample mounts. The instrument is operated under high vacuum conditions but sample compartment can be evacuated and vented independently from the rest of the spectrometer which makes sample changes more rapid. The sample compartment can also be purged with nitrogen gas if required. The spectrometer is remotely controlled using the OPUSTM software v.6.5. The Far IR & HR beamline is equipped with a number of different detector types, allowing sample analysis across a wide spectral range. A series of narrow band pass IR Optical Filters are available to reduce the bandwidth (and thus the noise), and apertures ranging from 0.5-12 mm can be used to reduce the beam diameter. 60 cm multipass glass cell for non-reactive samples. Single disc holder for transmission studies; for pressed discs or self-supporting samples 13 mm diameter. 60 cm heated multipass glass cell for reactive samples; cell can be heated to approx. 80 °C. N2ITRO Near Normal Incidence Transmission/Reflection Optics. cell is used for the study of gases, particulates and/or cluster species and can reach LN2 or LHe temperatures . Cryogen-cooled Cryostat; for pressed discs or self-supporting samples 10 mm in diameter. Can be cooled to liquid nitrogen temperatures. for the study of thin films or monolayers. Figure 2 shows a comparison between spectra recorded for a gaseous sample using a conventional thermal source (blue trace) and synchrotron radiation (red trace). The S/N obtained with the synchrotron is superior to that of a conventional thermal source by a factor of approximately 60. Figure 2. Synchrotron (red) vs conventional thermal source (blue): rotationally resolved spectra of a gaseous sample (0.001 cm-1 resolution).